I am a generalist and I am scared. I have a new job working back to back with shamelessly good specialists. I am dreaded not to keep up. 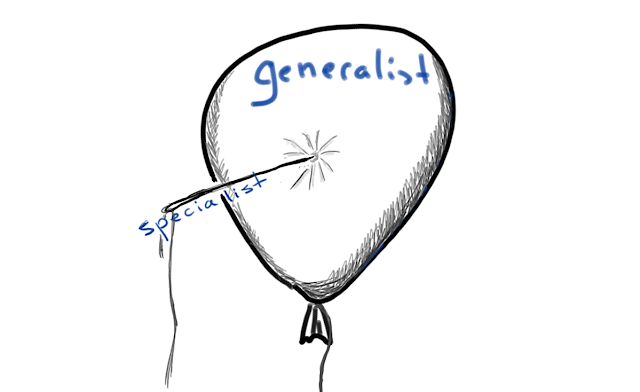 For a long time I was wondering what is better: to be a specialist or generalist? On the one hand, specialist is the best in his narrow field. When you need a build, sorry, DevOps expert, you hire a specialist. You need to solve a Machine Learning problem, you hire a Machine Learning expert and not some all-around guy! In addition to having those jobs just for you, being a specialist might pay a lot. When a company is at need, it will pay obscene amounts of money for a specialist to do "this thing right now!" Just look at 2K bug madness. In case you are old enough to remember this stuff. On the other hand, specialist is limited in career choices. Once you have invested all that time being Windows kernel expert, will you really move to be a PHP beginner programmer? I guess not. Generalist on the other hand, can switch fields at will. I did that. I've ran Linux since 1996, then moved to work at Microsoft. I've worked in storage then moved to access and security, then returned to storage and now moved to security. Wait, what???? On the other hand, from the money point of view, generalist can (usually) grow to be a bigger manager than specialist. Again, usually and if she wants to. It is generally easier to see a bigger picture when you are a generalist, which is a good starting point for a manager. Actually, the truth is that the company will not easily give up on specialist to turn him into another run-of-the-mill manager. However, in either case, from the money perspective, being a manager pays off. Taking all of this into account, I decided to be both :) Since I am a generalist by nature, my plan was to work as a generalist till I get to a point where it is hard for me to find a new job. Then I will specialize in something. Most probably some kernel. There are not much of kernel specialists and they are always in need. In addition, it is relatively hard to become one. The best part is that everyone expects the kernel guy to be over 50, not communicative and not to fit in. Well, the problem with my plan is the new places, like the one I'm in right now. Once I get to a new place, my impostor syndrome fears are multiplied by the generalist vs. specialists fears. Will I keep up? How could I ever match up with this guy that knows so much? Can she ever see me as her professional equal and come for advice? Usually it works out just fine. I also have my methods and cheats. The best one is to be always right. It is actually easier than it sounds. You just have to talk ONLY when you are 100% sure that you are right. In all other times: shut up. Another cheat is to learn at night. This works especially good when there is a problem found towards the end of the day. A meeting is set for tomorrow morning and everybody goes home. Then you read about the issue and everything you can find for as many hours as you could. At the morning meeting you definitely sounds like a specialist (which is the goal). I have a few more cheats in my sleeve, but I always wonder if this time I will be exposed. If this time, people will look at me and say: "He does not know this! He is not as good as we thought he will!"